Charlie is a term used in Blackjack to refer to a hand or hands that manage to get a certain number of cards without going bust. If a player manages to achieve this, they win automatically, regardless of what the Dealer hand is. The rules of Charlie, as well as the Blackjack strategy needed to utilise this ruling is something that can be used to have an advantage over the dealer and increase your chances of beating them. A five card Charlie refers to a hand(s) in which the total count of cards in the player’s hand is not over 21. For example, if a player had a hand of 2-3-4-5-7, this would be considered as a five card Charlie. It is possible to get a six, seven, eight, nine and ten card Charlie. Although instances in which ten cards do not exceed 21 are quite rare, a lucky few players can and do end up with such cards. 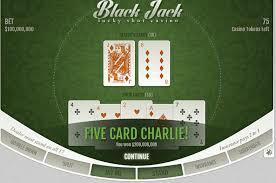 It is important to note that not all casinos class a Charlie as an automatic win. Be sure to do your research and familiarise yourself with the rules at the table before placing any bets. You may even have to hunt for the venue, when you do find it, you will find that the Charlie does have a significant negative impact on the house advantage. For example, an automatic win on a five card Charlie will lower the house edge by 1.46%. A six card and seven card Charlie will lower the house edge by 0.16% and 0.01% respectively. Based on these statistics, it is clear that the five card Charlie is the most advantageous. When you find a table that plays with the Charlie ruling, the strategy used is slightly different to when the Charlie rules do not apply. Below you will find more information about when to Hit or Stand. 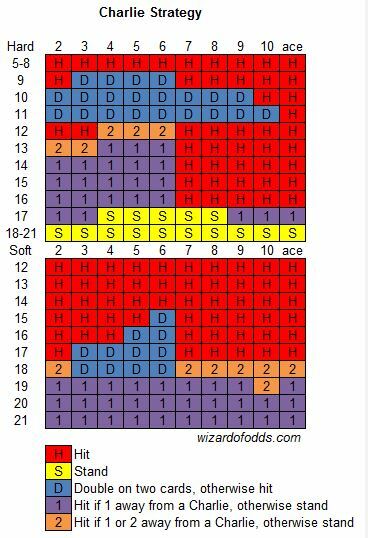 You should Hit if you have a hand with a total of 4-11 and the Dealer has 2,3,4,5,6,7,8,9,10 or an Ace. If you have a hand of 17,18,19, 20 and the dealer is showing 2,3,4,5,6,7,8,9,10 or Ace then you should stand. July 5, 2017 - Offer valid as of date published. T&Cs apply.